when starting my weight watchers journey this time around, i was wearing size 22s that were extremely tight, and, although i hate to admit it, i was also wearing some 24s. all from lane bryant. 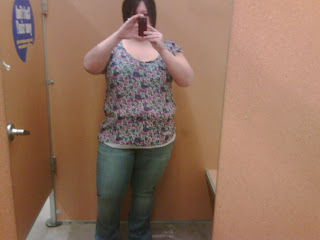 this is me in size 20 jeans from old navy...and a shirt in their normal girl sizes. by normal girl, i mean i didn't order it from the plus size "online only" section of old navy. didn't buy the jeans, just pumped that they fit. did buy the shirt - bonus? it was on sale! so, the online only weight watchers seems to be going well so far. i'm a scale peaker, can't help it. i'm down 2 lbs since monday. hope that trend continues. i am, however, still sucking at exercise. unless you count me cleaning like a madwoman and folding 10 loads of laundry. haha. it's back to richmond next week, so hopefully i'll be exercising again. thank you for forgiving the doublepost. hopefully the muffin top in the cute size 20 jeans don't scare you off. Yay pictures!! 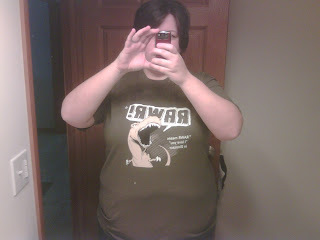 I especially like the dino t-shirt one... I love cute gifts like that. Proud of you for wearing cute small clothes! You rock! What a great positive inspirational post! And on that note I am off to the gym. Awesome job on the size 20's! I love that feeling of a new size. Sounds like you had a great weekend and you look really happy. You should catch up on Hell's Kitchen. It is really good. 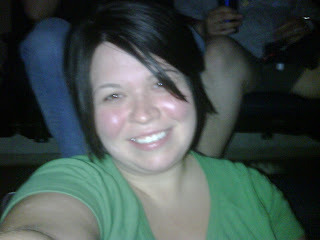 I am totally obsessed with Biggest Loser. I love Tara but I am so sad that Kristen is gone. I loved watching her interviews. They were the best. I am extremely sad there are only two episodes left. Who do you think will win? Beautiful flowers, love the shirts, congrats on the jeans! Woohoo all around lady!